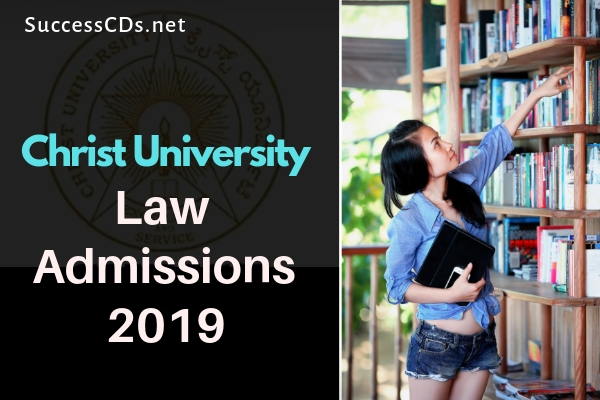 Christ University Law Entrance Exam 2019 is going to be conducted on 28th April 2019 for Session I and on 11th May for Session II. Candidates who fulfil the eligibility criteria. And wish to appear for the Entrance exam need to apply latest by 18th April 2019 for session I and 1st May for Session II. The duration of the Entrance Test will be for 90 minutes. Application Mode: All applicants using online mode must visit the page: https://appstat.christuniversity.in. Register by entering your NAME (as printed on Class 10 Marks Card) EMAIL-ID and set password. (The email id and mobile number provided will be used for sending confirmation and application status-update messages). To fill the application you must have a copy of statement of marks of Class 10, Class 11 or 12 (whichever is available) (Mandatory). Fill-in all the details in the “detailed application” page. Scan and upload recent passport size photograph (3.5 cms x 4.5 cms formal dress with white background) and click “Submit”. On clicking Submit, a viewable and editable page will appear on screen. In case you need to make any corrections; you may edit the data/details and then click “Confirm Submission”. Application registration fee may be paid through Credit / Debit Card / Net banking facility (for online applicants only). Choose the payment option and fill-in the required details to process the “Application processing fee”. The application will be submitted online after payment of application processing fee. After the payment is successful you will receive the application number with the option to print your application form. Print and sign the application form. Keep a copy of the application form for further reference and to produce at the time of selection process. Candidates must send the filled in application with the following documents mentioned below in an A4 size envelope only. Candidates must mark the [PROGRAMME APPLIED FOR] Admissions 2019 - [APPLICATION NO] on the top left-hand corner of the A4 size envelope for faster processing of application form. Candidates can submit / send their application form either in person or by registered post / courier service to the following address.